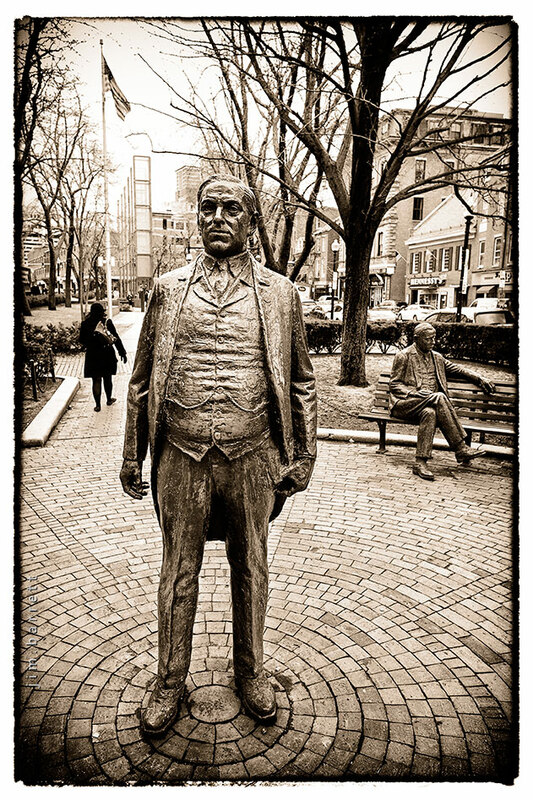 James Michael Curley, by artist Lloyd Lillie, on Congress Street, along the Freedom Trail in Boston. Curley became famous when as he was elected, in 1904, to the Boston Board of Alderman while serving time in prison on a fraud conviction. His colorful career included an indictment for influence peddling in 1943. He won a fourth term as mayor of Boston in 1945; despite a second indictment by a federal grand jury, for mail fraud. In 1947, he was sentenced to 6–18 months on the mail fraud conviction and spent five months at the Federal Correctional Institution in Danbury, CT before his sentence was commuted by President Truman. He was defeated for mayor in the 1949 election, thus ending his long political career. Curley is considered the inspiration for the protagonist Frank Skeffington in the novel The Last Hurrah by Edwin O'Connor, on which director John Ford based his film with the same title. Amazing craftsmanship in that brick pattern. Sure do appreciate your photos. Well Done! !